It's a well-kept secret that in Norway there exists a homebrewing tradition completely separate from the modern homebrewing that's taken off in the last few decades. The traditional homebrewers don't make porter and IPA, instead they make stjørdalsøl, konnjøl, maltøl and other old styles that hardly anyone outside of Norway ever heard of. Michael Jackson visited some of these brewers back in 1995, but since then things have been quiet. I've started digging into what little is known about this tradition, and this is my attempt to document what I've found so far. Before going on you should note that unlike the Lithuanian traditional beers I've written about, these beers are not available commercially. (Well, there's one exception.) Haandbryggeriet makes their Hesjeøl, which is the closest approximation that's widely available. Unfortunately, while it's an outstanding beer, and one of my favourites, it's not really a true traditional beer. Some people claim traditional Norwegian beer has been brewed the same way for thousands of years, but that's an exaggeration. What is true is that the tradition is so old that its beginnings are lost in the mists of pre-history. We know that the vikings brewed ale, and considered it to have religious significance. We also know that when Norway was Christianized this significance was also Christianized, and every farm was required by law to brew beer for Christmas. Beer was a key part of important rituals in people's daily lives, and presumably also outside of these rituals. Traces and remnants of these customs have survived up into living memory. My mother still tells the story of the last big, traditional wedding on the farm where she grew up. Traditional beer was brewed in huge quantities, and consumed over the three days the wedding lasted. This would, at a guess, have been some time in the 1960s. A number of changes were introduced over the years. One of the oldest we know of was the introduction of hops, which probably took place in the 14th century. Later, hops were grown commercially in some regions of Norway, but this has long since died out. At some point most brewers started boiling the wort, although some still don't. Gradually, many of the brewers stopped using their own hops, malt, and yeast, but some still do. In fact, one thing that stands out is the huge variety in techniques and ingredients. People brew according to tradition, but tradition is a living thing, and changes all the time. There are regional variations, but there are also big variations within each region. It's a bit like grandmas making meatballs: none of them follow exact recipes, and they all have their personal twists. So making a clear, overall picture is really tricky. There's a whole set of specialized terms used for home brewing, which are said to derive from a superstition that ingredients and equipment for brewing should not be referred to by their everyday names. The superstition is dead, but the terms live on, and so people talk of "sprakalog" (boiled water with juniper), "gilså" (fermentation vessel), "rost", etc. The terms differ in the different regions of Norway. A couple of systematic ethnological studies of traditional homebrewing were carried out in the 1940s and 50s. Big forms with lots of questions were filled in by hundreds of brewers, and supplemented by additional information from local school boards and other authorities. The picture that emerges is complicated, to put it mildly, but the big picture is clear: beer was homebrewed nearly everywhere in Norway south of the arctic circle. The main exception was the area just north of Oslo, where the tradition appears to have died out in the 18th century. The tradition was already under threat in the 1940s, and it has declined further since. Today there are just small, isolated pockets of it left, but there are places where the tradition still lives. Getting a clear picture of where traditional homebrewing is still alive today is very, very difficult. Lots of googling and asking around has produced some information, but the full picture is probably not known to anyone today. I've marked on the map below the places I've found evidence that traditional brewing is still, to some degree, alive. In Stjørdal near Trondheim there is a big, active community of traditional home brewers famous in Norway for their smoky beers. They generally produce their own malts, but yeast and hops are bought. Juniper branches are used in the brewing. Many use pharmacy hops and baking yeast. Sources claim there are more than 40 teams of home brewers just in Hegra, and probably more in the whole region. Less is known about the brewers in Sunnmøre, but it's clear that there are many of them, and that they are somewhat spread out geographically. Some brew "raw beer" where the wort is not boiled. Where they get their malt, hops, and yeast is not known. Every year they arrange a meeting of brewers where there's also a home brewing competition for the title of "beer king". Even less is known about the brewers in Indre Sogn. I have family there, and through them plus a bit of googling I know there are lots of traditional brewers in Sogndal, Leikanger, Kaupanger, and the Flåm valley, at least. It's very likely that brewing continues in other places in the area, too. Juniper branches are used here, too, but nothing is known about the other ingredients. I have seen Weyermann malt sacks, so probably they buy the malts. There are indications that they boil the wort. Voss is another famous hot spot of traditional brewing, and is the place Michael Jackson visited in '95. People here seem to produce their own malts, and boil the wort. Traditional yeast actually survives in this area, but very little is known about it. I'll return to this subject in a later blog post. Vossaøl (the local home brew) is famous for its quality, and it is possible that Voss Bryggeri will produce a commercial version, which would be extremely interesting. Hardanger and Morgedal I know almost nothing about. My guess is that the tradition has deteriorated further there than in the other four regions listed above, and that there are not as many brewers. Obviously, I can't leave it there. A whole beer culture pretty much unknown to science, literally on my own doorstep. So however difficult it's going to be, the plan is to do a tour of traditional brewers in spring next year, together with Martin Thibault. We plan to visit Voss, Indre Sogn, Sunnmøre, and Stjørdalen, and have managed to get in touch with brewers in some of these places, but not all. If you have more information, or have tips on people to contact, please do not hesitate to get in touch. Great post, very interested in this as farmhouse, Sours and traditional style beers I can get my hands on are bar none my favorites, I'll be keeping a close eye on you my friend. skol! Awesome read, I would love to know more about the raw beers and how to brew them. my lineage has some Norwegian roots and I would love to homebrew some of this history, and just like grandma's meatballs all make it my own. Very interesting, please post follow-ups. I'm interested in beer generally, and specifically beer that relates to pre-Christian Georgian mountain traditions. @Mike: I'll see if I can work out a kind of recipe for the raw ale. I have a book that may give enough detail for me to be able to give at least some detail. @Ben: Pre-Christian Georgia? That would have to date back to around 300 AD. Surely there can't be anything left alive of pre-Christian Georgian traditions today? Never heard anything about Georgian homebrew, but industrial Georgian beer is highly regarded in Russia. Never managed to find any of it myself. If you know anything about this I'd be very interested. Lars, I think you should've heard about Georgian mountain brewing tradition, because I think I mentioned it to you, when telling about a photographer (who is also a homebrewer) friend of mine who encountered it there first hand. I understand it's kind of a ritual passed over generations, and they brew it there only for Easter. How far back does it date it is unknown to me but I hope to find a lot more about it after my next spring's trip there (if I finally make it). That's extremely interesting. I've desperately wanted to go to Georgia for many years, and if they have traditional homebrew ... wow. I need to find out more. 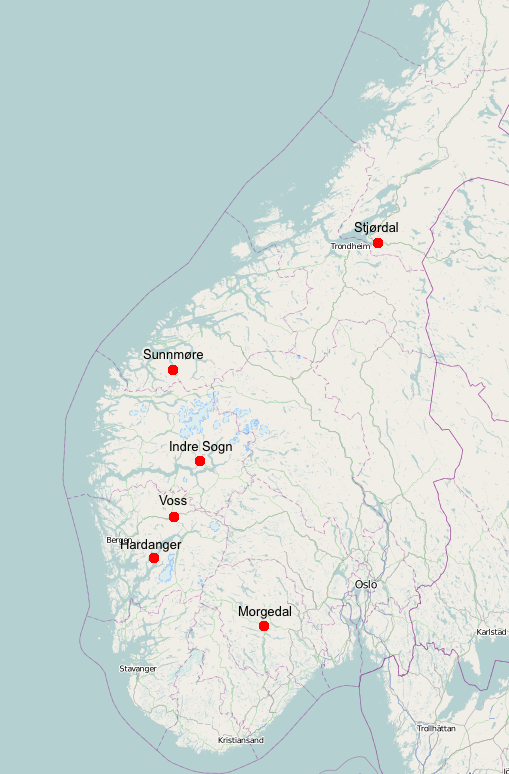 I have a feeling Oppdal can be added to the map, but I don't have much documentation. @Knut Albert: Looks like you're right. A little googling shows that Storli G�rd in Oppdal even sells malt�l to guests. Thanks for that bit of evidence! My wife spoke to someone from Valdres who brewed malt�l every Christmas. So I guess there are more spots to be added to the map. Please - if interested - make contact with Askim Beerclub, as I can see you are situated in Tomter. We are now 51 members in Askim Beerclub, half of the members are homebreewers. It would have been fun to get in touch - after what I read above here. I'm also doing research into traditional Norwegian brewing traditions and techniques. I'm a brewer in the US (www.scratchbeer.com) and we've been trying to recreate some Scandinavian recipes. (I'm a combination of Norwegian, Swedish, and Finnish by descent). Would you mind contacting me? I'd love to pick your brain about some of your findings and can share the little I've found myself! Odd Nordland's book Beer and Brewing Traditions in Norway has been a good resource, although it's a bit outdated. Wow! I can't thank you enough for the work you've done. I'm a 5th Generation Norwegian and all 16 of my great great grandparents settled in Vernon County, Wisconsin, USA in the late 1800's. I've always had an interest in genealogy and have started brewing about 9 years ago. So, guess what blog is now my favorite? I've always wanted to make a beer like my ancestors. Most of my family is from Oppland and I understand the brewing culture died out in the 1800's from one of your blogs. Keep up the great work! Would love to make it there one day. I've been eyeing up my neighbors juniper bush since I read your blog. I think some juniper water is on the horizon! Hi Lee. Yes, the recipe is here. I managed to visit a brewer and learn the recipe from him. I really enjoyed this post. I am just moving to Norway and I am very interested for everything about beer. So You made my vacation plans for the next year. Thank you, and for sure I will share what I'll found out.